I was wondering, how long does divinity need to set out before done? I put it on wax paper like it said and its been out for 4 hrs now and its 5pm and it hasn't hardened yet..
Its got to the point where it feels like the marshmallow stuff in a can but not as hard as I usually see them.. I can't even turn them over yet cause they're still sticky..
Any ideas on how long it will take before they start to get hard so I can turn them over? I'm sure it's much too late for this answer to your question to be of any help to you. What did you end up doing with your divinity candy? Did it finally set for you? Making divinity candy can be very tricky and challenging. 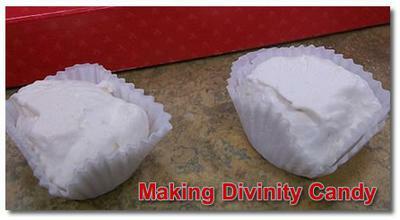 One of the most important tips is to only attempt making divinity when the weather is cool and dry. If there is too much moisture or humidity in the air, you are bound to have trouble. Some divinity recipes seem to be easier than others as far as their reliability for success. Does anyone have a "full proof divinity recipe" that they'd like to share? Please add it below if you do. It usually takes divinity about 2 hours or so to set. If you find that you have the same trouble next time you attempt making divinity candy, and it just isn't setting, here's a little something you can try. Place the divinity in the oven on a low heat (about 250 F.) for 15-30 minutes (as needed) until it sets to your desired consistency. Anyone else have any divinity candy making tips? Comments for How long does divinity need to set out before done? Thank you, thank you Patrick. Worked like a charm! Just made it for the first time. Followed recipe to the letter. It was hardening as I spooned it out. Turned out great. That remedy work. We turned the oven off though and let the Divinity sit 30 minites. Kind of like making Palova. It was a little runny but once it was stirred it set up beautifully. I know over the years I’ve thrown away many, many batches! I made Divinity last night and it would not set. It looked like pancakes. I was determined. I kept mixing. Then I found this blog. Patrick's tip worked. The divinity looks great. Now I'll wait twelve hours and see if I can peel them off the wax paper. YAY! Scroll down to Patrick's comment to read his suggestion for saving your divinity. Just wondering what Patrick's idea was to save the divinity. My divinity flopped and are round discs. I can't wait to try Patrick's fix when I get home. I'll let you all know how it works! The remedy posted by Patrick, above, worked perfectly. My first batch was tacky....followed the guidance there more or less to a T (likely less, I was multitasking) and it came out perfectly. I harvested and shelled my own black walnuts, and the batch of divinity came out too soft. I tried the oven method first, with little luck, and used the Patrick method. Thank you, it saved me from throwing out the whole batch! I never made Divinity before and I didn't do something right as it was runny and flat. I put it into a loaf pan and let it sit on the counter overnight but it was still not set. I followed Patrick's instructions, and another person's comment, to put it in the microwave for 3 minutes and the freezer for 10 minutes. That did the trick! This is a present for a disabled woman who hasn't had homemade Divinity since she was a kid and I will be delivering it today. So appreciate the advice and she will appreciate this gift!! One of the key things is let it go on high in the mixer for at least 6 mins if not a min or 2 longer. My first batch flopped because it was still a smidgen glossy....next batch i let go and go till wahlahhh it was perfect. I've had the same problem with divity and fudge not cooked long enough in the final stage 260 for divinity. They are both runny and will not harden. Sorry to say Also my mom said only make divinity when the sunshines. Thanks so much for saving my flopped divinity. I had to go 3 minutes in microwave for it to bubble up and I left it in the freezer for 10 minutes. It looks good and is delicious too! I use the recipe for divinity from the better homes and gardens cookbook! That recipe has been great for me. Even during rain it works! The only thing I can't get perfect is the look of smooth foam. It sets up almost too fast so it gets crumbly looking before I get to the end of the bowl! I use 4 cups white sugar, 1 cup light corn syrup, 3/4 cup water, 3 egg whites. Mix sugar, corn syrup and water til dissolved over medium heat stop mixing when dissolved, let cook over medium heat til temp on candy thermometer reaches 255. While waiting for temp to reach 255 beat egg whites in seperate bowl til at a stuff peak. Slowly pour syrup into egg whites once temp is reached while mixing on high til dull and firm. Use 2 spoons to scrape spoonfuls into wax paper then let dry. Works perfect for me every time. Yes, it is better to make divinity when there is less humidity in the air as it will set better. Maybe you can try the suggestion above about beating it over a double boiler. Should I have made my divinity a few days ago when it was dry and snowy? It's raining now. I had to give up on making divinity until I learned that when it doesn't set up (still in the bowl), beating it over a double boiler will fix the problem and give excellent results. I would like to know why that works, but it does every time. Cook first three ingredients until hard ball stage. Take off heat and stir in marshmallow cream and chopped nuts. Spoon on buttered plate.